Hand blown glass, steel, hand built ceramics, brick paving, landscaping. 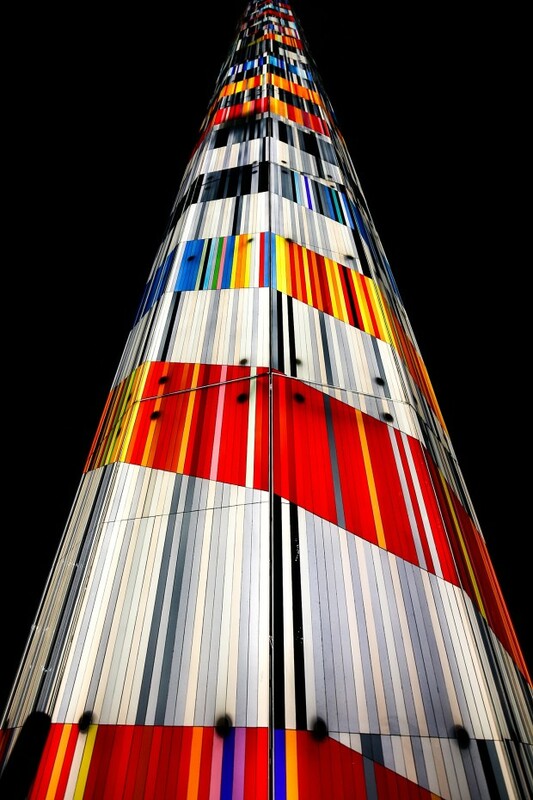 The tower is 51'h x 7.5' diameter, 80 panels of safety glass with diffuser layer and hand-blown glass laminated onto the surface. In developing my design concept I quickly became aware of the significant flowing movement approaching from P Street and 13th Street at the northeast corner of the plaza and the condominiums and offices rising vertically on all sides creating an urban architectural backdrop that offers itself to a monumental artwork element. My concept moved towards artwork that would address and unify both the architectural and ground level and thought of a tall tower to visually connect you to the plaza from a distance. 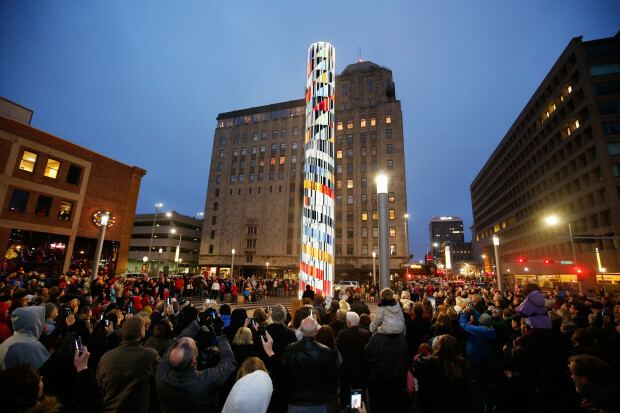 This engages people in looking up and down; stimulating their thoughts about the activity on the plaza and surrounding buildings and realizing that this visual experience gives them an additional awareness of everything’s interaction with each other. I positioned the tower 2/3 out toward the intersection to announce the site beyond its perimeter while remaining internal enough to be central to the site itself. 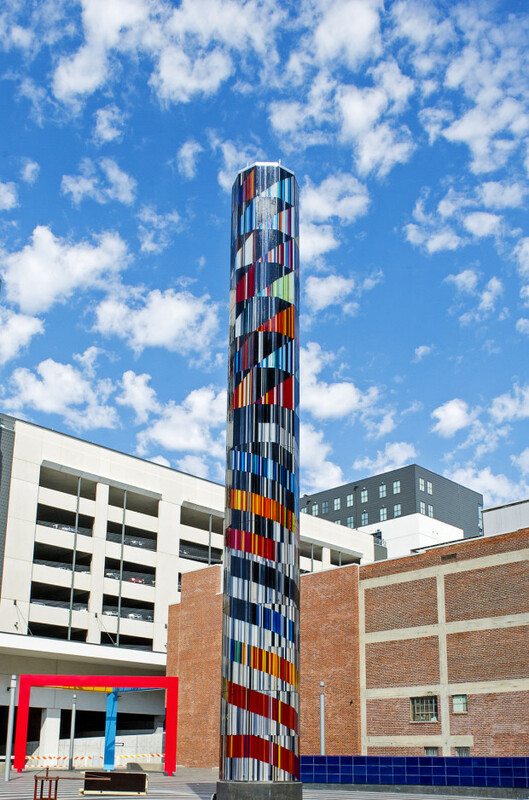 A column is a historically stable and visually dynamic shape with the obscured side always encouraging the natural inclination to move around the artwork and discover other perspectives and join the flowing movement stimulated by the paving design which emanates in concentric circles from the tower like a Japanese zen garden. 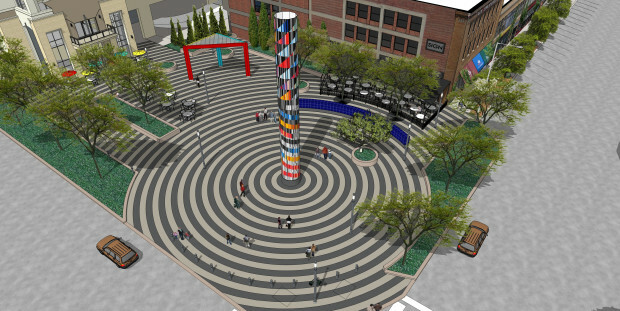 Over the course of five years the artist worked closely with Derix Art Glass Consultants to best design the artwork concept to the materials and with the City of Lincoln and Sinclaire-Hille Architects planning, engineering, meeting and coordinating to design a celebrated civic space for the disparate downtown population. 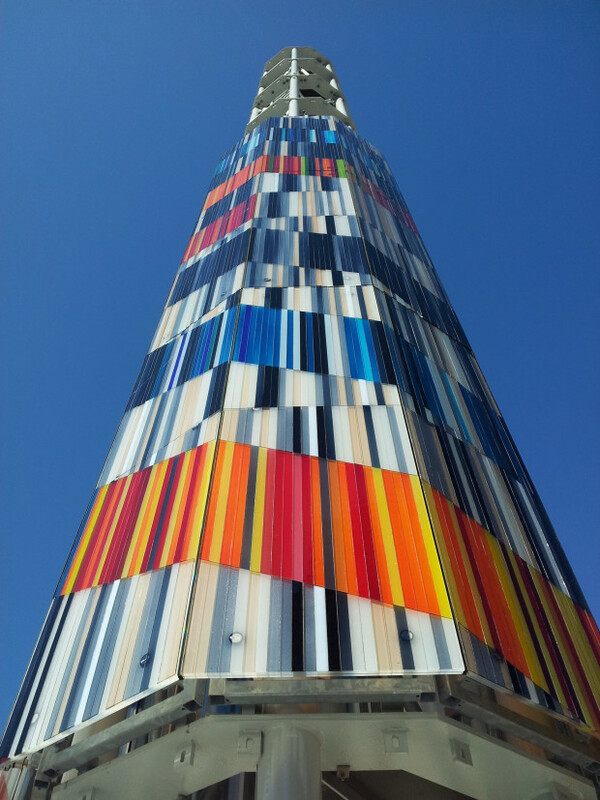 The Derix Glass Studio and Metallbau-Wimmer team worked on site for eight days installing the final panels September 16 to erect "Ascent”. Project budget is inclusive of all glass, tower structure, LED lighting, paving, hand built and glazed ceramic tile wall, all materials, shipping and labor for fabrication, installation, and design of the plaza in its entirety. 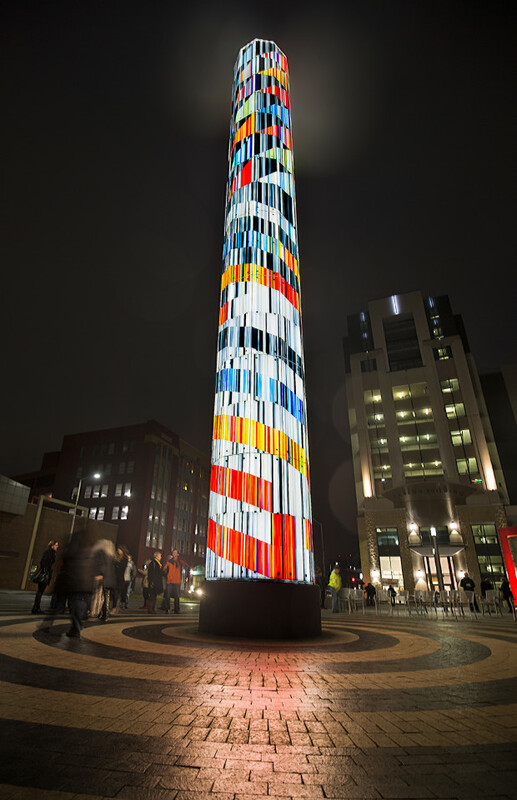 On the winter solstice, December 21st at 5:03PM, Ascent was illuminated with over 4,800 LED lights at a dedication ceremony hosted by the Lincoln Partners for Public Art Development (LPPAD) and the Lincoln Parks and Recreation. Each night the tower is illuminated from 7pm to 2am, and again from 6am to 9am. Winter illumination hours: 5pm to 2am and 5am to 8am.